Tubas: In an extra-judicial execution crime, on 10 January 2017, Israeli forces killed Mohammed Salhi (30) in al-Far’ah refugee camp. 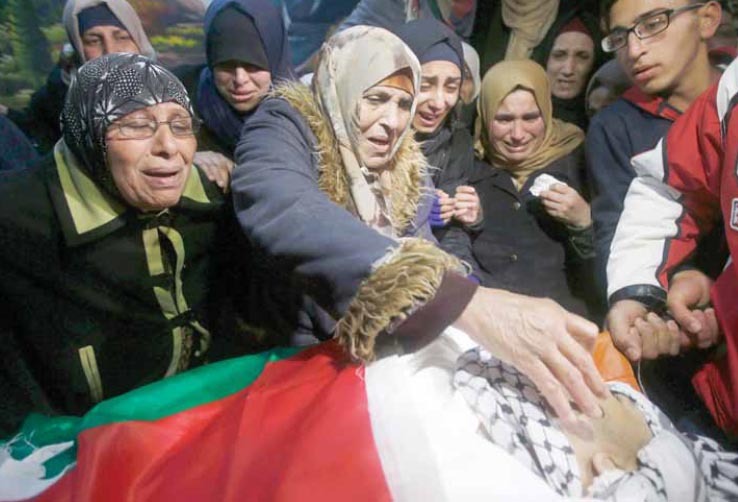 Israeli forces killed a Palestinian civilian at point-blank range in al-Far’ah refugee camp, in front of his mother. A Palestinian photojournalist was wounded, and then he and a reporter were beaten by Israeli soldiers. Israeli forces continued to target the Gaza Strip border areas, but no casualties were reported. Israeli forces conducted 54 incursions into Palestinian communities in the West Bank. 58 civilians, including 9 children and 3 women, were arrested. 18 of them, including 6 children and the 3 women, were arrested in occupied Jerusalem. 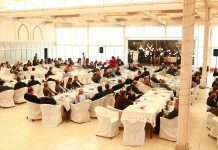 A decision to suspend the residency of 12 members of al-Qunbar family in al-Mukaber Mount. Lands of East Sawahrah were levelled, claiming they are State lands. Agricultural roads and a waterline were levelled in al-Ras al-Ahmar area in the Northern Valley. 4 Palestinian civilians, including a child, were arrested at military checkpoints. Israeli violations of international law and international humanitarian law in the oPt continued during the reporting period (05 – 11 January 2017). During the reporting period, Israeli forces killed two Palestinian civilians. The first one was killed after carrying out a run-over attack, targeting a number of Israeli soldiers in East Jerusalem. The second one was killed in a new cold-blooded crime in al-Far’ah refugee camp, south of Tubas. Israeli forces also wounded a Palestinian photojournalist and then beat him and another reporter. In the Gaza Strip, Israeli forces opened fire at Palestinian farmers in the border areas. In the West Bank, On 98 January 2017, Israeli forces killed Fadi al-Qunbar (28) from al-Mukaber Mount village, southeast of occupied Jerusalem, when he drove his truck into a group of Israeli soldiers, who were in the bus station near “Armon Hanatziv” settlement established on the lands of the aforementioned village. As a result, 3 Israeli soldiers and an officer were killed. In a new crime of extra-judicial execution, on 10 January 2017, Israeli forces shot dead in cold blood Mohammed al-Salhi (30) in al-Far’ah refugee camp, south of Tubas, with five bullets from a gun with a silencer. As a result, he was killed in front of his elderly mother. In the same context, Israeli forces wounded the photojournalist of “TransMedia” Agency, al-Muthana al-Deek, with a gas canister to his right leg while he was covering a protest organized by dozens Palestinian civilians and activists in the Northern Valley against settlement activities. After he was wounded, the Israeli soldiers beat him and the “Palestine Today” Reporter, Amoun al-Sheikh. In the Gaza Strip, in the context of targeting the border areas, on 10 January 2017, Israeli forces stationed along the border fence between the Gaza Strip and Israel opened fire at the agricultural fields, east of al-Maghazi in the central Gaza Strip, to the west of the abovementioned border. However, no casualties were reported. During the reporting period, Israeli forces conducted at least 54 military incursions into Palestinian communities in the West Bank. During these incursions, Israeli forces arrested at least 58 Palestinian civilians, including 9 children and 3 women. 18 of them, including 6 children and 3 women, were arrested in occupied Jerusalem. On 08 January 2017 following a run-over attack carried out by Fadi al-Qunbar (28), from al-Mukaber Mount village, near Armon Hanatzie settlement, Israeli forces started a series of collective punishments against the family and relatives of the aforementioned. Israeli forces raided their houses and arrested a number of his relatives. They also removed a mourning tent established for Fadi and threatened to demolish his family house after taking its measurements. As part of the estate seizure policy, on 08 January 2017, settlers seized a residential building in al-Rababah Valley neighbourhood in Silwan village, south of the Old City in occupied Jerusalem. The 2-storey building, which belongs to ‘Ali Mohammed Ahmed Sarhan, was built on an area of 140 square meters. The neighbours said that settlers belong to “al-‘Aad” settlement association that is active in Silwan to seize more buildings there. On 10 January 2017, Israeli forces levelled a 1300-meter waterline leading to the civilians’ houses between ‘Atouf area and Ras al-Ahmar. The waterline feeds residential compunds in the Northern Valley area, which is ‘Atouf and al-Ras al-Ahmar. The agricultural land leading to Kherbet al-Hadidyah was levelled by the Israeli bulldozers. In the same context, on 08 January 2017 following the run-over attack in occupied Jerusalem, dozens of Israeli settlers gathered at the intersection of “Yitsihar” settlement branching from Ramallah-Nablus Street, south of Nablus. The settlers closed the Street and threw stones at the Palestinian civilian cars. As a result, the cars’ windows were broken and its structures were damaged. On 11 January 2017, Israeli forces levelled an agricultural land between al-Bweib area in Masafer Yatta and Bani Na’im village, east of Hebron. Israeli forces claimed that the Israeli carried out the demolition without having an approval from the Israeli competent authorities. At approximately 01:00, Israeli forces moved into al-Fawar refugee camp, south of Hebron. They raided and searched a house belonging to Nahed Naseem al-‘Anati (22) and then arrested him. At approximately 03:00, Israeli forces moved into Tubas village. They raided and searched several houses after which they arrested 3 civilians and took them to an unknown destination. The arrested civilians were identified as Mos’ab Jaser Siyaj Daraghmah (28), an officer in the Palestinian National Security Service, Rami Ayman Husni Sharidah (27), an Education student in al-Quds Open University, and Bilal Mahyoub ‘Arif Sawaftah (18). At approximately 14:00, Israeli infantry units moved into Beit Ummer village, north of Hebron, patrolling from “Karmi Tsur” settlement, south of the village, and stationed between houses. A number of young men gathered and threw stones and empty bottles at the Israeli soldiers, who immediately fired sound bombs and tear gas canisters at them in response. As a result, a number of civilians suffered tear gas inhalation due to a sound bomb that fell between their houses. Later, Israeli forces withdrew from the village, but neither raids nor arrests were reported. Note: During the aforementioned day, Israeli forces conducted (4) incursions in the following areas and no arrests were reported: al-Thaheriyah, Sa’ir, Beit Awa villages and al-‘Aroub refugee camp in Hebron. At approximately 02:00, Israeli infantry units moved into al-Shyoukh village, north of Hebron. They raided and searched a house belonging to Sameer Sami Mohammed al-Halaiqah (23) and then handed him as a summons to refer to the Israeli Intelligence Service “Shabak” in “Gush Etzion” settlement complex, south of Bethlehem. Note: During the aforementioned day, Israeli forces conducted (5) incursions in the following areas and no arrests were reported: Beit Ummer, and Nuba villages in Hebron; al-Zawiyah village, west of Salfit; Birzeit village, north of Ramallah, and Jericho. At approximately 03:00, Israeli forces moved into Bani Na’im village, east of Hebron. They raided and searched a house belonging to Amin ‘Ali Mousa Manasrah (49) and then arrested him. Other Israeli forces raided a house belonging to Amin’s brother Yahyah (45), but no arrests were reported. Note: During the aforementioned day, Israeli forces conducted (3) incursions in the following areas and no arrests were reported: Kafel Hares village, north of Salfit; al-Thaheriyah and al-Samou’i villages in Hebron. At approximately 02:00, Israeli forces moved into Beit Ummer village, north of Hebron, and stationed in al-Bayada neighborhood. They raided and searched a house belonging to Khadoun Abdul Qader Mohammed Ekhlaeil (30) and then arrested him. At approximately 13:10, Israeli forces moved into the area between Beit Furik and Beit Dajan villages, east of Nablus. A number of young men gathered and threw stones and empty bottles at the Israeli soldiers, who immediately fired sound bombs and tear gas canisters at them in response. The soldiers then chased the stone-throwers into olive fields and arrested Ayham Zahi Khatatbah (15) from Beit Furik village. At approximately 23:30, Israeli forces moved into Kafer Ne’ma village, west of Ramallah. They raided and searched a house belonging to Ibrahim Mazen Abu ‘Adi (18) and then arrested him. Note: During the aforementioned day, Israeli forces conducted (5) incursions in the following areas and no arrests were reported: Halhoul and al-Thaheriyah village in Hebron; and Hawarah village, south of Nablus; Kafel Hares village, north of Salfit and Bruqin village, west of the city. At approximately 01:00, Israeli forces moved into Badras village, west of Ramallah. They raided and searched 2 houses belonging to Mos’ab Sami Mustafa ‘Awad (23) and Ahmed Yusuf Mustafa ‘Awad (20) and then arrested them. Israeli forces also confiscated money and cell phones from both houses. Around the same time, Israeli forces moved into al-Rahmah Mount area in the southern neighbourhoods in Hebron. They raided and searched a metal workshop belonging to Khalil Hashem al-Natshah and then withdrew. At approximately 02:00, Israeli forces moved into al-‘Aroub refugee camp, north of Hebron. They raided and searched 2 houses belonging to Ahmed Abdul Rahman Abu Sal (23) and Mohanned Jaber Abu Sal (22) and then arrested them. At approximately 03:00, Israeli forces moved into Jenin. They raided and searched a number of houses and then arrested ‘Allam Ziyad ‘Abahrah (43) and Mohammed Ahmed Abu Tame’i (46); both are teachers. At approximately 05:30, Israeli forces withdrew taking them to an unknown destination. Around the same time, Israeli forces moved into al-Jafatalak village, north of Jericho. They raided and searched 2 houses belonging to Mousa Sa’id Mawahrah (39) and Salah Ededn Omer D’aibes (17) and then arrested them. At approximately 23:45, Israeli forces moved into Kafer Qadoum village, northeast of Qalqiliyah. They raided and searched several houses and fired sound bombs and tear gas canisters. As a result, Shafiqah Ahmed Abdul Qader Jom’aah (80) suffered tear gas inhalation after which she was admitted to Darwish Nazzal Public Hospital in Qalqiliyah to receive medical treatment. At approximately 02:00 on Thursday, 10 January 2017, Israeli forces withdrew from the village, but no arrests were reported. Note: During the aforementioned day, Israeli forces conducted (8) incursions in the following areas and no arrests were reported: Burin village, south of Nablus; Qalqiliayah and Hablah village, south of the city; Yatta; Halahoul, al-Sahyoukh, Beit Awa and Kharsa villages in Hebron. At approximately 01:30, Israeli forces moved into Sa’ir village, east of Hebron. They raided and searched 3 houses after which they arrested 3 civilians namely Ya’qoub Mousa Jaradat (25), Yusuf Abdul Razeq Jaradat (22) and Fai Eshaq Jaradat (26). In an extra-judicial execution crime, on Tuesday dawn, 10 January 2017, Israeli forces shot dead in cold blood a Palestinian civilian in al-Far’ah refugee camp, south of Tubas, as they fired 5 bullets to the left side of his body and he died in front of his mother. According to PCHR’s investigations and the mother’s testimony, Fawziyah Mahmoud Khamis Salhi (67) said to PCHR’s fieldworker that at approximately 02:00 on the abovementioned day, Israeli forces moved into al-Far’ah refugee camp, south of Tubas. They surrounded the family house of Mohammed Subhi Ahmed Khamis Salhi (33) near a UNRWA School for Girls and the camp sports club, seemingly in order to arrest him. A number of Israeli soldiers jumped from the outer wall of the 1-storey house. Mohammed and his mother then heard noise in the corridor and went out of their bedroom. When his mother saw the soldiers, she stood between them and her son. An Israeli soldier then ordered her to sit on a plastic chair there, but when she refused, the soldier forcefully seated her. She then twice stood between the soldiers and her son. However in the third time she stood, the soldier forcefully pushed her and seated her on the chair. The soldier then pulled out a gun with a silencer and directly fired 5 bullets at Mohammed at point-blank range. As a result, the bullets penetrated his neck, chest, hand, armpit, pelvis and thigh from the left side of his body and killed him in front of his elderly mother. The mother said that she did not hear any sound of shooting, but saw sparkles coming from the gun. After that, her son swayed and fell on the ground. His body was put on a litter and then taken by an ambulance belonging to the Palestinian Red Crescent Society (PRCS) to Tubas Turkish Governmental Hospital in Tubas, where medical sources announced him dead. It should be mentioned that the Mohammed previously served a 3-year sentence in the Israeli prisons. He is also the only son of his parents and has a married sister in ‘Asker refugee camp and their father died few months ago. In the same context, Israeli forces arrested 4 civilians from al- Far’ah camp after raiding their houses. The arrested civilians were identified as Mohammed Saleh Farid Jabarin (26), Fadi Omer Nassar Nabhan (25) Mahmud Nathmi Mahmud Abu al-Hassan (27) and Rabi’ Jamal Mubarak (23). Around the same time, Israeli forces moved into Beit Ummer village, north of Hebron. They raided and searched a house belonging to Suleiman ‘Ali Mohammed Abu ‘Ayash (50). The soldiers confiscated jewelry from the house and handed the family a list of the confiscated items. They later withdrew, but no arrests were reported. Following that, Israeli forces raided and searched a house belonging to Mahmud Mohammed Darwish ‘Aadi (44). They then withdrew, but no arrests were reported. In the same time, another Israeli force moved into Qaa’a al-Harah area. They raided and searched a house belonging to Ahmed Khalil Abu Hashem (48) after breaking the main door. They locked the family members in a room as they stayed in the house for an hour and a half. The soldiers also arrested Ahmed’s sons Qusai (16) and Yusuf (24) and confiscated a cell phone and around NIS 2600. The family said they were saving the money to pay a financial penalty for their detained son Hamzah. In the morning, Israeli forces released Yusuf at “Etzion“ military camp, south of Bethlehem. At approximately 02:30, Israeli forces moved in to Jabaa’ village, south of Jenin. They raided and searched a number of houses. At approximately 06:30, they arrested 10 civilians; most of them were teachers. Israeli forces questioned a number of the arrested civilians and then released them at approximately 10:00, while the others were taken to Salem Military camp, west of Jenin, and were released at approximately 13:00 on the same day. At approximately 22:30, Israeli forces stationed along the border fence between the Gaza Strip and Israel, east of al- Maghazi in the central Gaza Strip, opened fire at Palestinian agricultural fields, west of the abovementioned border fence, but no arrests were reported. Note: During the aforementioned day, Israeli forces conducted (3) incursions in the following areas and no arrests were reported: Qaryout village, southeast of Nablus; Sa’ir and al-Thaheriyah villages in Hebron. At approximately 01:30, Israeli forces moved into ‘Asker al-Balad, east of Nablus. They raided and searched a house belonging to Talal Othman Jaber Duwaikat (53), former mayor of Jenin and his brother’s house. They arrested Talal and took him to an unknown destination. Around the same time, Israeli forces moved into al-Balata refugee camp and al-Dahiyah al-Tahtah adjacent to the camp, east of Nablus. They raided and searched a number of houses after which they arrested Murad Hmaidan Abu Shushah (21) and Ahmed Khalil al-Qaisi (20). At approximately 03:00, Israeli forces moved into Jenin. They raided and searched a number of houses and then arrested Sa’id Mohammed Herzaallah (22). At approximately 04:00, they withdrew taking him to an unknown destination. Around the same time, Israeli forces moved into Dura, southwest of Hebron, and stationed in al-Tanak neighborhood. They raided and searched a house belonging to Hamzah Khaled Abu ‘Arqub (19) and then arrested him. Israeli forces moved then into Sawad Valley. They raided and searched a house belonging to Shawkat ‘Ali al-‘Amairah (36), but no arrests were reported. Note: During the aforementioned day, Israeli forces conducted (4) incursions in the following areas and no arrests were reported: ‘Ourta and Rujib villages, south of Nablus; Sa’ir and Ethna villages in Hebron. At approximately 11:00 on Thursday, 15 January 2017, dozens of Palestinian civilians and activists organized a demonstration in al-Hemmah area in the Northern Valley, east of Tubas. The protestors attempted to remove a tent established by a settler in the area, but existence of Israeli soldiers and settlers in the area prevented them from doing so. Following this, the protestors moved to “Qozh” settlement outpost located between “Salit” and “Makhula” settlements and is one kilometer away from “Qozh” The participants headed traveling their cars along with the press crews, who came to cover the demonstration, towards Street (90) to approach the abovementioned settlement outpost. Israeli forces, who were about 400 meters away from them, closed the street by their jeeps while other soldiers banned the participants from moving forward. When the participants stepped out of their cars, the Israeli soldiers immediately fired sound bombs at them. In the meantime, Amoun al-Sheikh, a report at Palestine Today Channel, al-Muthana Samir Abdullah al-Deek, a photojournalist at TransMedia Company, were standing about 3 meters away from the soldiers and participants as they were covering the events. When a soldier saw them, he threw a tear gas canister at them that hit al-Deek’s right hand. As a result, both of them sustained tear gas inhalation. A soldier, who was holding a baton, rushed towards them and hit al-Sheikh at her abdomen and pushed her. He then hit al-Deek several times on his abdomen, so the camera fell off al-Deek’s hands to the ground. When he attempted to carry the camera, the soldier continued beating him on his abdomen and pushing him. The soldier then pushed both journalists into their car and closed its door. Al-Deek arrived by his car at a place where Palestinian ambulances parked. He was taken to Tubas Turkish Hospital where he underwent medical tests. 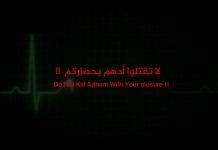 Al-Deek was then transferred to Arab Specialist Hospital in Nablus. 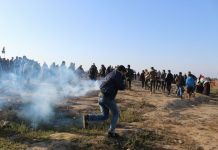 Following the Friday prayer, on 06 January 2017, dozens of Palestinian civilians and Israeli and international human rights defenders organized demonstrations in Bil’in and Ni’lin villages, west of Ramallah, and al-Nabi Saleh village, northwest of the city, and Kafer Qadoum village, northeast of Qalqiliyah, protesting against the annexation wall and settlement activities. Israeli forces forcibly dispersed the protests, firing live and metal bullets, tear gas canisters and sound bombs. They also chased the protesters into olive fields and between houses. As a result, many of the protesters suffered tear gas inhalation while others sustained bruises as Israeli soldiers beat them up. Hebron: Israeli forces established (10) checkpoints all over the city. On Thursday, 05 January 2017, Israeli forces established 2 checkpoints at the northern entrance to Yatta village and at the entrance to al-Fawar refugee camp. On Saturday, 07 January 2017, Israeli forces established 3 checkpoints at the entrances to Tarama and Farsh al-Hawa villages and at the entrance to al-‘Aroub refugee camp. On Sunday, 08 January 2017, Israeli forces established 2 similar checkpoints at the entrances to Yatta and Kharsa villages. On Monday, 09 January 2017, Israeli forces established 3 checkpoints at the entrances to Karma and Ethna villages and al-Fawar refugee camp. On Tuesday, 10 January, they established 3 similar checkpoints at the entrances to Dier Samet and al-Koum villages and al-‘Aroub refugee camp. On Wednesday, 11 January 2017, Israeli forces established 2 checkpoints at the entrances to Beit Ummer village and al-Fawar refugee camp. Ramallah and al-Bireh: Israeli forces established (10) checkpoints all over the city. At approximately 09:30 on Saturday, 07 January 2017, Israeli forces established a checkpoint at the intersection of al-Tayba village (al-Mo’arajat street between Ramallah and Jericho). At approximately 07:30, Israeli forces established 3 similar checkpoints near ‘Ain Sina intersection, north of Ramallah; and at the entrances to ‘Ain Yabroud village, northeast of the city; and Kherbitha al-Mosbah village, southwest of the city. On Monday, 09 January 2017, Israeli forces established 6 checkpoints between Selwad and ‘Ain Yabroud villages, northeast of the city; near Khirbitha al-Mosbah village; between Ras Karkar and Dier Buzaigh villages; at the entrance to Shaqbah village, west of the city; at the entrance to Biteen village, northeast of the city; ‘Atara village’s bridge and at the northern entrance to Birzeit. Salfit: Israeli forces established (6) checkpoints all over the city. On Saturday, 07 January 2017, Israeli forces established 3 checkpoints at the entrances to Deir Balout and Kafur al-Deek villages, west of Salfit; and Mardah village, north of the city. On Monday, 09 January 2017, Israeli forces established 3 checkpoints at the entrances to Rafaat, Kafur al-Deek and Burqeen villages, west of Salfit. At approximately 17:00, Israeli forces established a similar checkpoint at the entrance to Askaka village, east of the city. Qalqiliya: Israeli forces established (5) checkpoints all over the city. On Saturday, 07 January 2017, Israeli forces established 6 checkpoints at the eastern entrance to Qalqilyia; at the entrances to Jensafout, ‘Ezbit al-Tabeeb, and ‘Azoun villages, east of the city; Jeet village, northeast of the city; and Hablah village, south of the city. On Monday, 09 January 2017, Israeli forces established 2 checkpoints at the entrance to ‘Azoun village, east of Qalqiliya and at the intersection of Jeet village, northeast of the city. At approximately 14:50 on Monday, they established a similar checkpoint at the eastern entrance to Qalqiliya. At approximately 16:00 on Tuesday, 10 January 2017, Israeli forces established a checkpoint on al-Bathan road, northeast of Nablus. Around the same time, they established a similar checkpoint on ‘Asira road, north of the city. On Thursday, 05 January 2017, Israeli forces stationed at al-Karama crossing arrested Islam Moa’ied Mohamed Hamaid (29), from Beit ‘Anan village, northwest of Jerusalem. Islam was arrested while travelling to Jordan. At approximately 11:30 on Saturday, 07 January 2017, Israeli forces stationed around al-Ibrahimi mosque in Hebron, arrested Mohamed Mahmoud ‘Isaa Abu ‘Aram (21), from Yatta village, south of Hebron. At approximately 17:30 on Saturday, Israeli forces established a checkpoint at the entrance to ‘Ezbit al-Tabeeb village, east of Qalqiliya. They checked the Palestinian civilians’ IDs and their vehicles as well. After that, Israeli forces arrested ‘Alaa ‘Isaa al-Doyari (23), from Qalqiliya. At approximately 17:00 on Monday, 09 January 2017, Israeli forces arrested Nidal Omar al-Faroukh (16), from Sa’ir village, east of Hebron, while coming from Bethlehem. Nidal was detained at a checkpoint and was then taken to an unknown destination. On Sunday, 08 January 2017, Israeli forces shot dead a Palestinian truck driver near “Armon Hanatziv” settlement established on al-Mukaber Mount lands, southeast of occupied Jerusalem. According to PCHR’s investigations, at approximately 13:30 on the same day, a number of Israeli soldiers stepped out of a bus in a station at the entrance to “Armon Hanatziv” settlement while other Israeli soldiers were in a park in the area. In the meantime, a truck with an Israeli registration plate swerved towards the soldiers, who stepped out of the bus, and ran over some of them. The truck driver returned again and ran over them. The Israeli soldiers stationed in the area directly opened fire at the driver and he sustained serious wounds. As a result, the driver succumbed to his wounds in the truck. The victim was later identified as Fadi Ahmed Hamdan al-Qunbar (28), from al-Mukaber Mount village, and was a former prisoner. Following the run-over attack carried out by Fadi al-Qunbar (28), from al-Mukaber Mount village, southeast of occupied Jerusalem, on 08 January 2017, near” Armon Hanatziv” settlement, Israeli forces carried out a series of collective punishments against Fadi’s family and his relatives. An hour later of carrying out the attack, Israeli forces raided al-Qanabrah neighbourhood in al-Mukaber Mount village, where Fadi’s family house is located, and closed all entrances to the neighbourhood. After that, Israeli Special Forces and intelligence officers raided and searched Fadi’s house, Parent’s house and his siblings’ houses. They also damaged its furniture and attacked its residents. An Israeli officer from the Explosive Engineering Unit took photos and measurements of the victim’s house while another officer threatened Fadi’s wife and his relatives that they will soon demolish Fadi’s house. It should be noted that Fadi used to live in his house along with his wife and their 4 children. Eyewitnesses said that Israeli forces orally warned Fadi’s relatives of establishing a mourning tent for Fadi. They then arrested his father (85); his mother, Menwa al-Qunbar (70); his wife Tahani al-Qunbar (22); his two brothers Monther (22) and Mohamed (30); his sister Shadia; and two cousins. All of the abovementioned arrested persons were taken to al-Maskobiya prison in West Jerusalem, to question them. In the mid night, Israeli forces released Fadi’s mother while the others were kept in custody. At approximately 08:00 on Monday, 09 January 2017, Israeli forces raided Fadi’s house and prevented his family from establishing a mourning tent. Moreover, Israeli Special Forces and Intelligence officers damaged many chairs in the mourning tent and arrested Fadi’s parents again. They released them at approximately 12:00 on the same day. Menwa Qunbar- Fadi’s mother: A decision to suspend her residency in Jerusalem. Suha Qunbar- Fadi’s sister: A decision to suspend her residency in Jerusalem. Murad Aweisat- Suha’s husband: A decision to cancel his “reunion” application as well as cancelling the reunion applications and residency of their two children (Nagham 11, and Wadi’a, 17). Dia’ Aweisat (21)-Fadi’s nephew (Hind’s son): A decision to suspend his residency and cancel his “reunion” application. Manal Qunbar- Fadi’s sister in law (Sami’s wife): A decision to suspend her residency and cancel his “reunion” application. At approximately 02:00, Israeli forces moved into al-‘Aiswiya village, northeast of occupied Jerusalem. They raided and searched many houses and arrested 6 civilians, including 3 children. The arrested persons were identified as Naief Waseem ‘Obaid (14), ‘Emad Tareq Sarandah (13), Mohamed Mar’I Derbas (16), Ma’moun Abu Riyalah (20), Nidal Faroukh (22) and Dawoud Derbas (22). At approximately 02:00 on Tuesday, 10 January 2017, Israeli forces moved into al-Mukaber Mount village, southeast of occupied Jerusalem. They raided and searched houses from which they arrested Radi ‘Aziz ‘Owisat (14), Adham Abed ‘Owisat (14) and Karam Raied ‘Owisat (13). On the same day, Saleem ‘Abed al-Rahman ‘Owis (54) surrendered to the Israeli Prison Service to serve a 9-month sentence issued against him in September 2016. It should be noted that ‘Owis was subject to a house arrest and was deported from Jerusalem for a year. After that, he was again under house arrest for 4 months before the court’s decision of actual imprisonment. Israeli municipality handed ‘Isaa Ja’afrah an administrative notice to demolish his family house in al-Jesir area in Silwan village, south of occupied East Jerusalem’s Old City, under the pretext of non-licencing. In November 2016, ‘Isaa built his house with woods, tin plates and gypsum after Israeli bulldozers demolished his family house under the pretext of non-licencing. 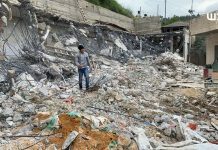 Ja’afrah said that on 26 October 2015, the Israeli municipality demolished his family house comprised of 4 apartments and displaced its inhabitants. As a result, he built another house on his family land near the rubble and lived there along with his 8-member family, including 6 children. After that, Israeli municipality crews raided his house and handed him an administrative demolition notice. On Tuesday, 10 January 2017, Israeli forces accompanied by a vehicle of the Israeli Civil Administration and a bulldozer moved into al-Sawahra lands, east of occupied Jerusalem. They demolished around 300 dunums of the lands. A source from al-Sawahra Municipality said to PCHR’s fieldworker that the abovementioned lands were reclaimed a year ago by Land Research Center and Oxfam to plant eucalyptus trees in the future. Therefore, some seedlings were planted as an experimental stage. Israeli authorities claimed that these lands are state-owned property and around 60% of those lands were leveled. 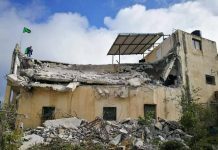 The Municipality lawyer managed to stop the demolition order after he resorted to the Israeli Supreme Court. A source from the Municipality confirmed that the owners of those lands have documents refuting the Israeli claims that they are State lands. On Monday, 08 January 2017, a number of Israeli settlers raided a building in al-Rababah Valley neighborhood in Silwan village, south of occupied East Jerusalem’s Old City. The 2-storey building belongs to ‘Ali Mohamed Ahmed Sarhan and is built on an area of 140 square meters. The neighbors said to PCHR’s fieldworker that around 12 Israeli settlers from ‘Ad settlement association raided the building that was empty of residents in order to seize more facilities and buildings in Silwan. At approximately 09:00 on Thursday, 05 January 2017, Israeli forces accompanied with a military vehicle and another vehicle of the Israeli Civil Administration moved into the western area of Tarqumiya village, northwest of Hebron. A Civil Administration officer then handed ‘Alaa Ghazi Qa’qour (35) a notice to stop building his house under the pretext of non-licensing. The abovementioned under-construction house is built on an area of 100 square meters. It should be mentioned that Israeli authorities handed the abovementioned civilian a similar notice at the beginning of September 2016. At approximately 09:00 on Tuesday, 10 January 2017, Israeli forces accompanied by a military vehicle; vehicle of the Israeli Civil Administration and 3 bulldozers moved into Kherbit al-Ras al-Ahmar, east of Tubas. Israeli bulldozers damaged a 1300-meter waterline between ‘Atouf area and Ras al-Ahmar area. The waterline presented by ACF feeds the residential compounds in the Northern Valley. Moreover, Israeli forces damaged an agricultural road leading to Kherbit al-Hadidiya, where Israeli forces demolished about 1800 meters of the road. This project was presented by donor countries and implemented by GVC. At approximately 08:00 on Wednesday, 11 January 2017, Israeli forces accompanied with 3 vehicles of the Israeli Civil Administration and a bulldozer moved into al-Bowaib area in Yatta village, south of Hebron. Israeli bulldozers demolished a 1700-meter agricultural road between al-Khirbah and Bani Na’iem village, east of Hebron. Israeli forces claimed that the Israeli levelling in this road was without any approval from the Israeli competent authorities. At approximately 19:30 on Sunday, 08 January 2017, following the run-over attack in occupied Jerusalem, dozens of Israeli settlers from “Yitzhar” settlement, south of Nablus gathered. Israeli settlers closed the Ramallah-Nablus Street and threw stones at palestinian vehicles traveling on the street and damaged them before of Israeli forces and police intervened to evacuate the settlers and opened the road before the Palestinians’ movement.